The geography nights at my local homeschool co-op always prove successful as both parents and children approach geography from a hands-on approach that creates enthusiasm. For our event, the children were instructed to create a display based on a geographical location of their choice. Some children chose a body of water, a national park, or a state for their display. Besides the visual display, each child provided a snack associated with the chosen location and a stamp or sticker for the passport books the visitors would carry with them. As an added bonus, the children who could point to each location on the map and say each place they visited would receive a little prize. The displays showed creativity and a love for experiencing learning. The attendees and participants enjoy seeing how others design their display, if they will wear costumes, and what foods they chose to bring. Some of the children made handouts of fun facts while others gave a n introduction speech to each visitor. 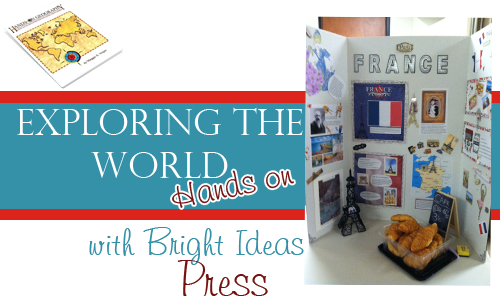 My daughter chose France for her contribution to geography night. We decided to go with the tri-fold display and serve croissants. Since we were not studying France at the time, we spent four weeks of research before the big night. During that time, my daughter picked out the aspects of Frace that stood out most to her and incorporated those in her display. It is always interesting to see what your child gravitates to in a study. My daughter enjoyed learning history and the fun geographical facts about the country. However, her favorite aspects were the Louvre and the Eiffel Tower. I firmly believe that hands-on activities increase a love of learning and boost retention. My daughter still talks about the things she learned not only from her own study but from other displays from geography night. Creating a geography night with your homeschool co-op is easier than you may think. Keep in mind, this type of event works beautifully with a small group of friends or as a family event if you are not part of a co-op. Curious students willing to put together a visual display. A place large enough to host the event such as a church, library, or even someone’s home. Someone willing to spearhead the project by setting a date, keeping participants informed, setting up the venue, etc. Someone to create simple passports which attendees carry to each station for stamps. Have you ever held a geography fair or geography night? I’d love to hear how it compared to the experience I have shared here.